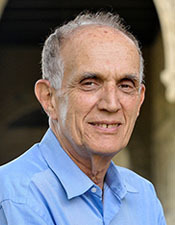 ALEXANDRIA, VA (November 12, 2018): The International Prize in Statistics has been awarded to Bradley Efron, professor of statistics and biomedical data science at Stanford University, in recognition of the "bootstrap," a method he developed in 1977 for assessing the uncertainty of scientific results that has had extraordinary impact across many scientific fields. "Because the bootstrap is easy for a computer to calculate and is applicable in an exceptionally wide range of situations, the method has found use in many fields of science, technology, medicine and public affairs," says Sir David Cox, inaugural winner of the International Prize in Statistics. 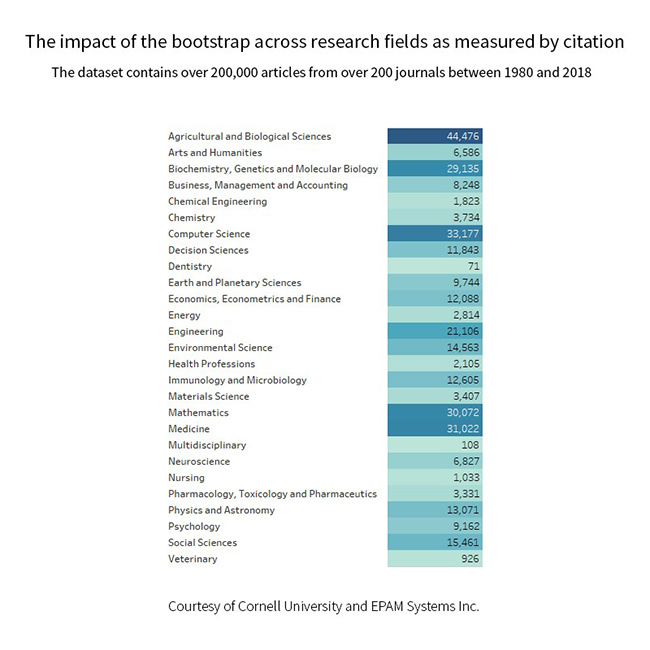 "While statistics offers no magic pill for quantitative scientific investigations, the bootstrap is the best statistical pain reliever ever produced," says Xiao-Li Meng, Whipple V. N. Jones Professor of Statistics at Harvard University. "It has saved countless scientists and researchers the headache of finding a way to assess uncertainty in complex problems by providing a simple and practical way to do so in many seemingly hopeless situations." 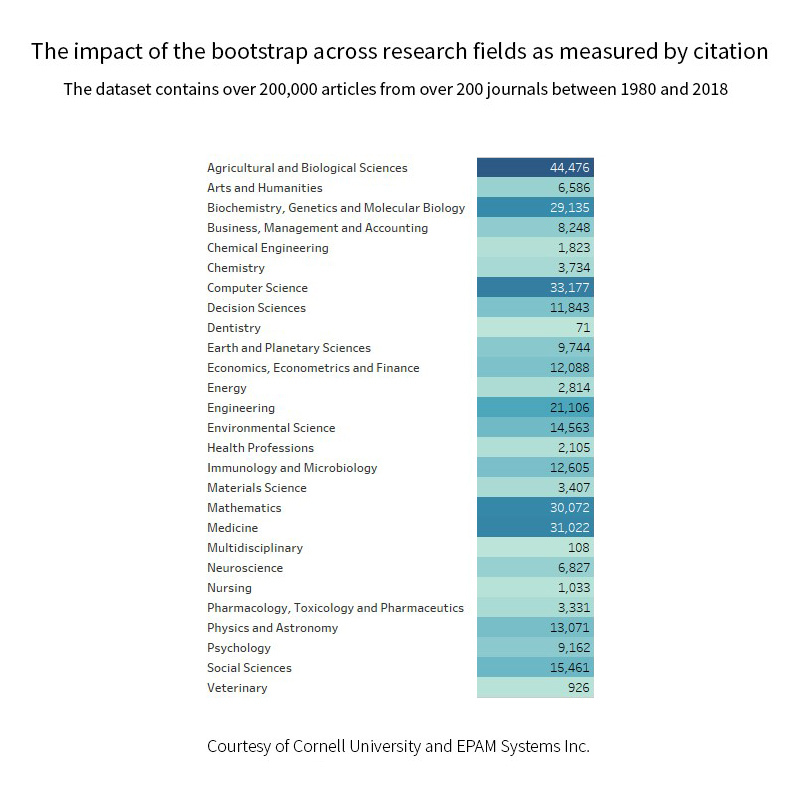 "The bootstrap was a quantum leap in statistical methodology that has enabled researchers to improve the lives of people everywhere," says Sally Morton, dean of and professor of statistics in the Virginia Tech College of Science. "Efron is a statistical poet of enormous beauty, applicability and impact." Efron was born in May 1938 to Russian immigrants and grew up in St. Paul, Minnesota. He credits his salesman father, Miles, for cultivating in him a love of math and science, in part through baseball and bowling scoring. "He kept track of these things," says Efron, "so I grew up with a lot of numbers around me and that was very helpful—I was training to be a statistician without realizing it." He won a national merit scholarship the year it was first introduced and went to Caltech. It was more than an intellectually eye-opening experience. "I'd never seen a mountain or an ocean," says Efron. Initially, he thought he was going to become a mathematician, but he realized abstract mathematics was not where his interests or talents lay. Enrolling in a PhD program at Stanford, he switched to statistics. "I remember when going into statistics that first year I thought, ‘This will be pretty easy, I've dealt with math and that's supposed to be hard.' But statistics was much harder for me at the beginning than any other field. It took years before I felt really comfortable." The name was inspired by the 18th-century fictional character Baron Munchausen and a variation of a story in which he pulls himself out of a swamp by his own bootstraps. In a similar vein, the statistician or scientist could now use their own data to assess the uncertainty in their own data. Initially, Efron's paper on the bootstrap was rejected for publication because it didn't have enough theorems—so he added some at the end. "The truth is, I didn't think it was anything wonderful when I did it," says Efron. "But it was one of those lucky ideas that is better than it seems at first view." It was a tool many scientists could use, and use easily, especially as personal computing provided the power to do the number crunching. And it worked. Suppose you want to know the average household income in your city. You can't afford a complete census, so you randomly sample 100 households, record the 100 incomes and take their average, say $29,308. That sounds precise, but you would like some estimate of how accurate it really is. A straightforward, but impractical, approach would be to take several more random samples of 100 households, compute the average each time and see how much the averages differed from each other. The bootstrap lets you approximate this impractical approach using only the original sample's data. A bootstrap data set is a random sample of size 100 drawn from the original 100 incomes. You can imagine writing each of the original incomes on a slip of paper, putting the slips into a hat and randomly drawing a slip out. Record the number, put the slip back into the hat and repeat this process 99 more times. The result would be a bootstrap data set, and we can make as many bootstrap data sets as we wish, each time taking their average. Let's say we do 250 of them, giving 250 bootstrap averages. The variability of the 250 averages is the bootstrap estimate of accuracy for the original estimate $29,308. Five leading international statistics organizations have collaborated to launch the biennial International Prize in Statistics. The prize recognizes the "major achievement" of an individual or team in the field of statistics. Simultaneously, this prize helps raise media and public awareness of the growing importance of statistics to modern life and promotes understanding of the myriad and diverse ways statistics affects the lives of every person alive today. The primary objective of the International Prize in Statistics is to call public attention to the important role statistics, data analysis, probability, and the understanding of uncertainty have played in the past and are playing today in the advancement of society, science, technology and human welfare, with a decided focus on current developments. Another leading objective is to identify penetrating and valuable insights and advances in statistics that can help achieve the primary objective. The first International Prize in Statistics was awarded in July 2017, to David R. Cox. If you would like to learn more, or would consider supporting the award financially, contact Ron Wasserstein, executive director of the American Statistical Association. The American Statistical Association is the leading authority on statistics in the United States and a prominent organization in the field internationally. Since its founding in 1839, the ASA has supported excellence in the development, application and dissemination of statistics through advocacy, education, meetings, publications and member programs. Its 19,000 members serve in industry, government and academia in more than 90 countries, advancing research and promoting sound statistical practice to inform public policy and improve human welfare. The Institute of Mathematical Statistics is an international professional and scholarly society devoted to the development, dissemination and application of statistics and probability. The institute has about 4,500 members in all parts of the world. The International Biometric Society is an international society promoting the development and application of statistical and mathematical theory and methods in the biosciences, including agriculture, biomedical science and public health, ecology, environmental sciences, forestry, and allied disciplines. The society welcomes as members statisticians, mathematicians, biological scientists, and others devoted to interdisciplinary efforts in advancing the collection and interpretation of information in the biosciences. The International Statistical Institute is unmatched in its global reach among statisticians and those interested in the field of statistics. It is an association that links national statistical societies, with special focus on the societies in developing regions of the world. A majority of the world's central bureaus of statistics are represented within the ISI network. Its influence within the international statistical community is supported by the seven ISI Associations—each specialize in a particular area of statistics—and its committees, which are active interest groups. The Royal Statistical Society is one of the world's most distinguished statistical societies. It is both a learned society for statistics and a professional body for statisticians. The RSS was founded in 1834 as the Statistical Society of London and became the Royal Statistical Society by Royal Charter in 1887. Today, the society has more than 7,000 members around the world. The RSS is active in a wide range of areas both directly and indirectly relevant to the study and application of statistics. Other statistical societies will soon be given the opportunity to take part in the governance of the International Prize in Statistics.